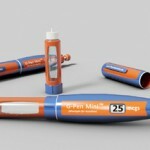 DiabetesMine – Next-Gen Emergency Glucagon: Xeris to the Rescue? Who wants to face a complicated nine-step mixing process when your PWD loved one is passed out on the floor?! Thankfully, the race is on to develop the next generation of rescue glucagon to replace the powder + syringe mixes housed in those red and orange plastic cases made by Eli Lilly and Novo Nordisk.